Accidents and injuries have become an unavoidable part of life, but the fact that accidents are relatively commonplace does not detract from the pain and confusion that can result when an accident or personal injury happens to you or a loved one. This is especially true when any harm could have been avoided if others had not acted carelessly. It is our hope that the following information will answer some of the questions you may have about your circumstances. For further assistance, contact an experienced Nevada personal injury or lawyer in Reno or Las Vegas. Personal injuries are frequently caused by automobile accidents, vehicle accidents and other car related accidents. If you are injured in Nevada in an automobile accident, vehicle accident or other car related accident in Las Vegas or Reno, then you will likely need a Las Vegas or Reno lawyer or attorney to help you to receive the compensation you deserve under the law for your pain and suffering, injuries, medical bills, doctor bills, hospital bills, loss of wages from inability to work, prescription costs, etc. To find a Nevada personal injury attorney or lawyer in Reno or Las Vegas to help you with an injury accident please click here for www.AttorneyGuide.com – the premier on-line directory of Certified Ethical™ attorneys for the State of Nevada. Where can I find a Personal Injury or Accident Attorney or Accident Lawyer in Las Vegas or Reno, Nevada? Go to www.AttorneyGuide.com or click “Search for an Attorney” on the horizontal navigation bar at the top of the page. Choose your city and state, and then select Personal Injury Law and the type of case that best matches your situation. 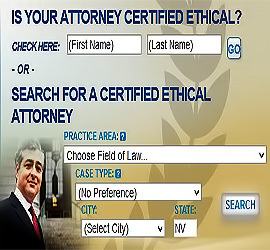 AttorneyGuide will search our directory of Certified Ethical™ attorneys and provide you with their contact information. Formal “Lawsuit”: Unlike criminal cases, which are initiated by the government, a formal personal injury case typically starts when a private individual (the “plaintiff”) files a civil “complaint” against another person, business, corporation, or government agency (the “defendant”), alleging that they acted carelessly or irresponsibly in connection with an accident or injury that caused harm. This action is known as “filing a lawsuit”. Informal Settlement: Most disputes over fault for an accident or injury are resolved through informal early settlement, usually among those personally involved in the dispute, their insurers, and Nevada personal injury or accident lawyers in Reno or Las Vegas representing both sides. A settlement frequently takes the form of negotiation, followed by a written agreement in which both sides forgo any further action (such as a lawsuit), choosing instead to resolve the matter through payment of an agreed upon amount of money. (Note: the “middle ground” between a lawsuit and an informal settlement is an alternative dispute resolution procedure like mediation and arbitration. An experienced Nevada personal injury or accident lawyer in Reno or Las Vegas, can help you determine which option is best for your situation.) The best way to find a Nevada personal injury attorney or lawyer in Las Vegas or Reno is to click here: www.AttorneyGuide.com. Why do I need a Nevada personal injury or accident attorney or lawyer? When you or your loved one suffer an injury as the result of somebody else’s action, perhaps it seems natural that the person would offer to compensate you for your injury, or that their insurance company will do the right thing and offer a fair settlement. Unfortunately, that rarely happens. Many people will not take responsibility for their actions, and insurance companies profit from under compensating injury victims. Insurance companies and their lawyers also know the governing law backwards and forwards, and they know that most non-lawyers have no idea what legal rights and remedies they possess. Personal injuries are frequently caused by automobile accidents, vehicle accidents and other car related accidents. If you are injured in Nevada in an automobile accident, vehicle accident or other car related accident in Las Vegas or Reno, then you will likely need a Las Vegas or Reno lawyer or attorney to help you to receive the compensation you deserve under the law for your pain and suffering, injuries, medical bills, doctor bills, hospital bills, loss of wages from inability to work, prescription costs, etc. To find a Nevada personal injury attorney or lawyer in Reno or Las Vegas to help you with an injury accident, please click here for www.AttorneyGuide.com – the premier on-line directory of Certified Ethical™ attorneys for the State of Nevada. An experienced Nevada personal injury lawyer, a personal injury attorney in Reno or Las Vegas or other Nevada personal injury attorney or lawyer knows how to build your case, how to negotiate your case with an insurance company, and, if necessary, how to take your case to trial. While it is possible to negotiate your claim with an insurance company yourself, insurance companies will typically do everything they can to take advantage of you and to effect the lowest possible settlement, while attempting to elicit statements from you that will damage your position if you ultimately decide to sue. A lawyer is in a good position to help you obtain a favorable settlement that, even with the attorney fee deducted, generally significantly exceeds what you can obtain on your own. The best way to find a Nevada personal injury attorney or lawyer in Las Vegas or Reno, is to click here: www.AttorneyGuide.com. How much does a Nevada personal injury attorney cost? The amount of the contingent fee your lawyer will charge will vary somewhat from state to state. In most states, the attorney fee will be between 25% and 40% of a personal injury award. Attorney fees for workers’ compensation cases are more tightly regulated, and are typically lower than that for regular personal injury matters. If your case is potentially worth a lot of money, you may be able to negotiate a reduction of the attorney’s contingent fee – however, the best personal injury lawyers in Las Vegas and Reno are usually not willing to negotiate their fees. An experienced Nevada personal injury attorney, or personal injury lawyer, in Reno or Las Vegas know that they are often able to recover substantially more money for their clients than attorneys with lesser skills, resulting in a greater award to you regardless of the percentage taken by the attorney. Personal injuries are frequently caused by automobile accidents, vehicle accidents and other car related accidents. If you are injured in Nevada in an automobile accident, vehicle accident or other car related accident in Las Vegas or Reno, then you will likely need a Las Vegas or Reno lawyer or attorney to help you to receive the compensation you deserve under the law for your pain and suffering, injuries, medical bills, doctor bills, hospital bills, loss of wages from inability to work, prescription costs, etc. To find a Nevada personal injury attorney or lawyer in Reno or Las Vegas to help you with an injury accident please click here for www.AttorneyGuide.com – the premier on-line directory of Certified Ethical™ attorneys for the State of Nevada. Where are personal injury lawsuits filed in Las Vegas and Reno Nevada? Las Vegas and Reno personal injury and accident lawsuits usually fall under the jurisdiction of state courts in the county where the injury occurred, or where those involved in the incident are located. Las Vegas or Reno personal injury cases in which a relatively low amount of damages is sought (typically a maximum of $2000 to $5000) most often must be filed in a Small Claims Court. An exception to the rule of state court jurisdiction arises when parties in a personal injury case live in different states, and the case involves an amount “in controversy” over $75,000. Such a personal injury case may be filed under federal jurisdiction in the federal trial courts (called U.S. District Courts), or the case may be moved there if it was originally filed in a state court. Issues of jurisdiction can be tricky for those unfamiliar with the legal process, but an experienced Nevada personal injury attorney, a personal injury lawyer or attorney in Reno or Las Vegas or other Nevada personal injury lawyer or attorney can sort through any problems that may arise in deciding where to file a lawsuit. Generally speaking, when someone acts in a careless way and causes an injury to another person, under the legal principle of “negligence” the careless person will be legally liable for any resulting harm as defined by personal injury law. This basis for assessing and determining fault is utilized in most disputes involving an accident or injury, during informal settlement talks and up through a trial in a personal injury lawsuit. Personal injuries are frequently caused by automobile accidents, vehicle accidents and other car related accidents. If you are injured in Nevada in an automobile accident, vehicle accident or other car related accident in Las Vegas or Reno, then you will likely need a Las Vegas or Reno lawyer or attorney to help you to receive the compensation you deserve under the law for your pain and suffering, injuries, medical bills, doctor bills, hospital bills, loss of wages from inability to work, prescription costs, etc. To find a Nevada personal injury attorney or lawyer in Reno or Las Vegas to help you with an injury accident, please click here for www.AttorneyGuide.com – the premier on-line directory of Certified Ethical™ attorneys for the State of Nevada. Who Might be Responsible for Negligence? 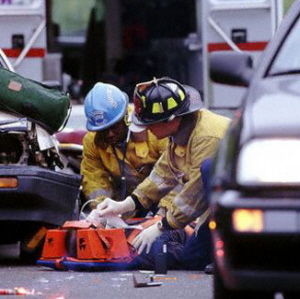 In some legal disputes that arise after an accident or injury, the concept of negligence may extend to people or entities that were not directly involved in what took place. Under a theory of negligence called “vicarious liability,” employers and other indirectly responsible parties can be involved in a personal injury case. For practical purposes, in personal injury cases vicarious liability is often used to make certain that an injured person can recover his or her damages from the most financially secure and adequately insured party. Keep in mind that the concept of negligence is not limited to the action (or inaction) of an individual. Small businesses, partnerships, organizations, and large corporations may all be held legally responsible in situations where they failed to properly ensure the safety of others. This is especially true in personal injury cases that stem from defective and dangerous products (against product manufacturers, distributors, and sellers) and in “slip-and-fall” cases (against commercial businesses and corporate property owners). Personal injuries are frequently caused by automobile accidents, vehicle accidents or other car related accidents. If you are injured in Nevada in an automobile accident, vehicle accident and other car related accident in Las Vegas or Reno, then you will likely need a Las Vegas or Reno lawyer or attorney to help you to receive the compensation you deserve under the law for your pain and suffering, injuries, medical bills, doctor bills, hospital bills, loss of wages from inability to work, prescription costs, etc. To find a Nevada personal injury attorney or lawyer in Reno or Las Vegas to help you with an injury accident, please click here for www.AttorneyGuide.com – the premier on-line directory of Certified Ethical™ attorneys for the State of Nevada. While the concept of negligence applies to most types of personal injury cases, certain kinds of injury claims will use a different rule of fault called “strict liability.” If you are injured by a defective product, or through certain inherently dangerous activities like the shipping of toxic chemicals or the keeping of a dangerous animal, your case will likely proceed under this legal theory. While the rules are different from those in negligence cases, the good news is that when compared to negligence claims, a plaintiff in a “strict liability” personal injury case does not ordinarily need to show that the defendant was at fault — only that the product or activity was unreasonably dangerous, and plaintiff’s injuries were the result. The best way to find a Nevada personal injury attorney or lawyer in Las Vegas or Reno is to click here: www.AttorneyGuide.com. What are the first steps in settling my Nevada personal injury claim? If an accident occurred somewhere other than in your home, return to the scene as soon as possible to locate any evidence and photograph any conditions you believe may have caused or contributed to the accident. You may be amazed to find something you were not aware of when the accident occurred but which may help explain what happened: a worn or torn spot on which you fell, a traffic light that isn’t working. And while looking around, you may also find someone who saw what happened, or who knows of other accidents that happened in the same spot. Take photographs of the accident scene from a number of different angles — particularly your view of things right before the accident — to keep a good picture of it in your mind and to give to the insurance company later on to indicate how well prepared you are to get the settlement you deserve. Photograph the scene at the same time of day as your accident occurred, and for vehicle accidents, the same day of the week, to show the appropriate amount of traffic. Who was at fault for an accident is sometimes shown by a piece of “physical” evidence — something you can see or touch, as opposed to a description of what happened. Examples include a broken stair that caused a fall, the dent in a car showing where it was hit, or an overhanging branch that blocked visibility on a bike path. In addition, physical evidence can help prove the extent of an injury: Damage to the car can demonstrate how hard a collision was, and torn or bloodied clothing can show your physical injuries dramatically. Try to preserve any physical evidence exactly as it was at the accident. If you can’t preserve the actual object, take photographs of it. You can later show your evidence to an insurance company as proof of what happened. If you intend to file a claim for your injuries, it’s important to notify potential defendants after the accident. You don’t have to know who was at fault for your accident; you must simply think about who might have been at fault. In the beginning, you don’t have to give the people involved, or their insurance companies, any detailed information about the accident or your injuries. All you have to do is notify them that there was an accident at a certain time and place, that you were injured, and that you intend to file a claim. Where Can I Find the Laws that Govern Personal Injury Cases? To understand how pre-existing case law (or “legal precedent”) might be used to strengthen an injury case, suppose that you are involved in an accident or are injured, and decide to hire an experienced Nevada personal injury or accident lawyer in Reno or Las Vegas to protect your legal rights. During settlement negotiations with insurers or opposing counsel, and especially in any legal filings with the court, your lawyer will make reference to (or “cite”) prior cases in which the courts in your state decided on issues like fault or damages, in ways that are favorable to your position. Personal injuries are frequently caused by automobile accidents, vehicle accidents and other car related accidents. If you are injured in Nevada in an automobile accident, vehicle accident or other car related accident in Las Vegas or Reno, then you will likely need a Las Vegas or Reno lawyer or attorney to help you to receive the compensation you deserve under the law for your pain and suffering, injuries, medical bills, doctor bills, hospital bills, loss of wages from inability to work, prescription costs, etc. To find a Nevada personal injury attorney or lawyer in Reno or Las Vegas to help you with an injury accident please click here for www.AttorneyGuide.com – the premier on-line directory of Certified Ethical™ attorneys for the State of Nevada. Yes we can get compensation after an injury if we know law properly. We should consult with an expert lawyer before asking for compensation, because a lawyer can help us to get enough compensation. This article is really good and helpful to everyone. Thank you for sharing this article. Do not be afraid to seek compensation after a auto injury, it is important you protect your health and avoid chronic pain.